853126 AT-AT Driver, Ben Kenobi, TIE Fighter Pilot Magnet Set is a Star Wars Magnet set released in February 2011. 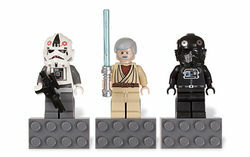 Included Minifigures are: Obi-Wan Kenobi, TIE Fighter Pilot, and an AT-AT Pilot. The AT-AT Pilot, or AT-AT Driver specializes in piloting the All-Terrain Armored Transport (or AT-AT). Unlike normal Stormtroopers, they have Imperial Symbols on their helmets. They fought in the Battle of Hoth where they piloted the AT-AT walkers towards the Rebel base. TIE Pilots fly TIE fighters, along with other craft such as shuttles and Imperial landers. Many TIE Pilots died during Imperial missions. As with all Minifigure magnets, the torso, hips and legs cannot be separated and are therefore all one piece. Facts about "853126 AT-AT Driver, Ben Kenobi, TIE Fighter Pilot Magnet Set"